sailboat. 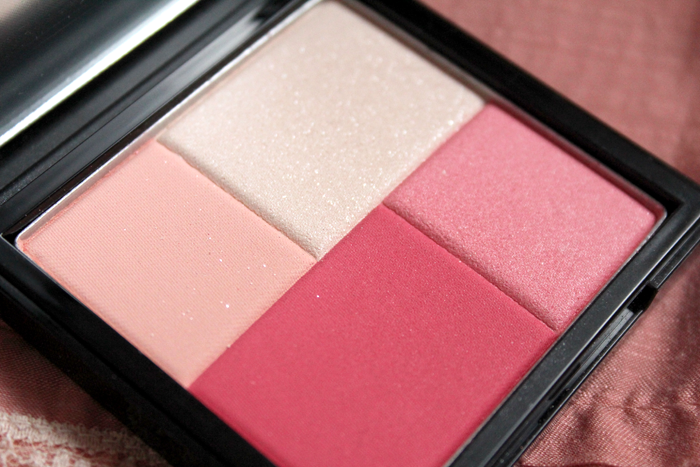 : Review: Touch in Sol Multi Shining Colours blush in Lovely Pink. 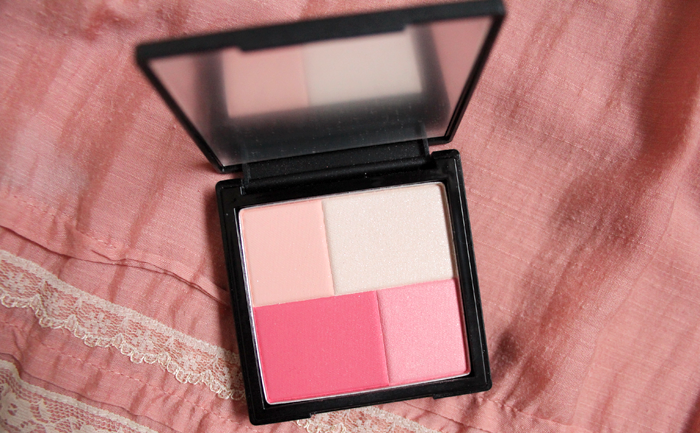 Review: Touch in Sol Multi Shining Colours blush in Lovely Pink. 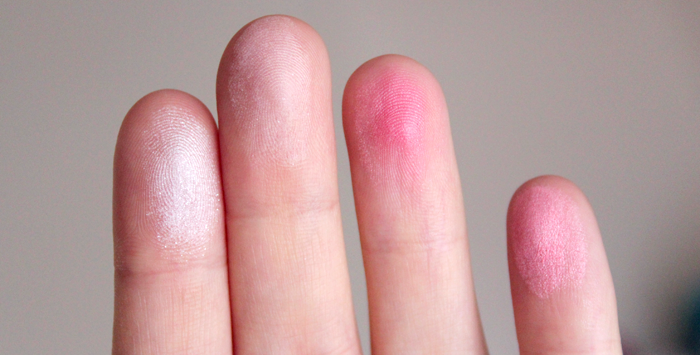 (Left to Right) White highlighter shade, baby pink shade, deepest rosy pink, medium shimmery pink. 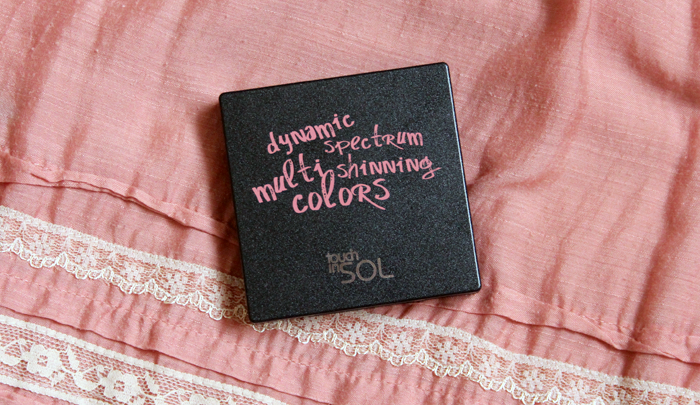 Touch in Sol is a brand I had never really heard much about before they sent me a little parcel of goodies to test out, so I really had no idea what to expect but I was excited to try out the Multi Shining Colours blush in Lovely Pink. It's true, I have an addiction to blush, especially when they look so pretty in the pan like this one does. The packaging is really sturdy, large enough to feel substantial & like you're getting a lot of product but sleek enough not to be too bulky or difficult to store. There's a large mirror in the compact, which I think is a really nice touch and really handy for touch ups on the go. There's an impressive 18g of product! There are four different colours in the pan; a shimmery shell shade that's perfect for highlighting, a matte pale pink, a medium shimmery pink and a deeper satin rosy pink shade, which are all beautifully pigmented and not chalky. The mixture of matte and shimmery shades is really lovely, it makes it a versatile little palette that I've found myself reaching for a lot. Each of the four shades are large enough to use individually, you can really get your brush in there easily or you can swirl them all together like I've been doing to give a soft pink glowing flush to the cheeks. It easily lasts 7 hours on my normal/dry skin, I do like to apply a little more just to get me through the last few hours of the day but I'm really impressed with the wear time. It also doesn't go patchy or cakey if you feel like applying a little more and it's really easy to blend. Initially I thought the £15 price tag (£16.70 when not on sale) was a little much because it's in a similar price bracket to MAC and Illamasqua, which are brands I'm more familiar with but that probably reflects more on me than the product though and it is always good to try new things. While I do still think if it were a few pounds cheaper it would be a little more appealing, I think the price really reflects the quality of the product and the packaging. I'm really quite impressed and I would definitely purchase another colour in the range! As far as I know the only place you can purchase Touch in Sol in the UK is from their website here. Have you ever tried anything from this brand before? I love how there are different shades in the one product - and they're all really pretty! This looks so pretty on you - no wonder you're so keen on blush! You really do suit it! My olive skin is scared of blush! This is so pretty, I love the subtle shimmer! the colours are amazing <3 ! Ooh this looks lovely! Perfect for summer! Oh waw how pretty is this one!! I love the pink flush it gives your cheeks, it looks really natural and healthy. Too bad it's only sold online, or I would've looked for a counter to take a closer look. Looks pretty on you, but reminds me of those blushes laid out in a similar way by Collection which RRP at about £4...so I'd feel a bit odd parting with £15 for one!